Theatre Bristol Summer Camp 2015: THE START OF ADVENTURE! Theatre Bristol would like to invite your whole family to help celebrate its 50th anniversary season! For our special anniversary, we are bringing back the beloved children’s summer camp, serving children from kindergarten to 6th grade! 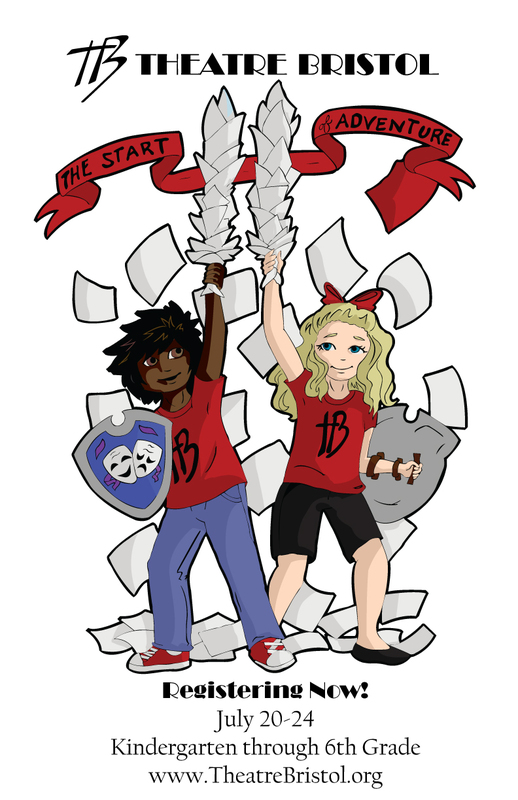 This year’s theme is The Start of Adventure: Classic Tales Retake the Stage. This camp will honor the adored Catherine DeCaterina, the founder of Theatre Bristol. DeCaterina believed in young children getting involved in the arts, and our mission is to share the joy she brought to the youth of our community. We will be celebrating our Golden Anniversary season by bringing back three classic tales from DeCaterina’s time that our young groups will perform at the end of the week. K-1st will perform the classic Cinderella, 2nd-4th will bring to life the Southern legend of Tom Sawyer, and 5th-6th will entertain young and old with the story of Rip Van Winkle. As a special treat to the campers and family members, the Theatre Bristol Youth Service Board will perform Land of the Jesters, the first show ever produced by Theatre Bristol. We will also include additional workshops in acting, music, dance, and technical theatre (set, costumes, props, and makeup). The camp will be staffed by the Theatre Bristol Youth Service Board, with special guest theatre professionals from our region. Your child will be provided a safe environment to learn, grow, and make new friends. The camp will be held at Theatre Bristol, 506 State Street, Bristol, TN and will run July 20th-24th. Camp will run Monday to Friday from 8:45am to 4:30pm, with early drop-off and late pick-up times available. The early bird registration discount period begins May 4, with a cost of only $125 per child, and $50 for each additional sibling. Regular registration begins May 25. The cost per camper is $150, with a family discount of each additional child reduced to $75. Theatre Bristol will be open from 10am to 2pm Saturday, June 27th and July 11th to register at the office on 512 State Street. Because Cathy believed money should never get in the way of a child’s passion for theatre, financial assistance applications are also available. Space is limited so register soon! Please contact us at info@theatrebristol.org for more information. We hope you will join us in this historical milestone celebrating 50 years of Catherine DeCaterina’s legacy! To register, please click HERE or download the REGISTRATION FORM. To apply for financial aid, download the form HERE.